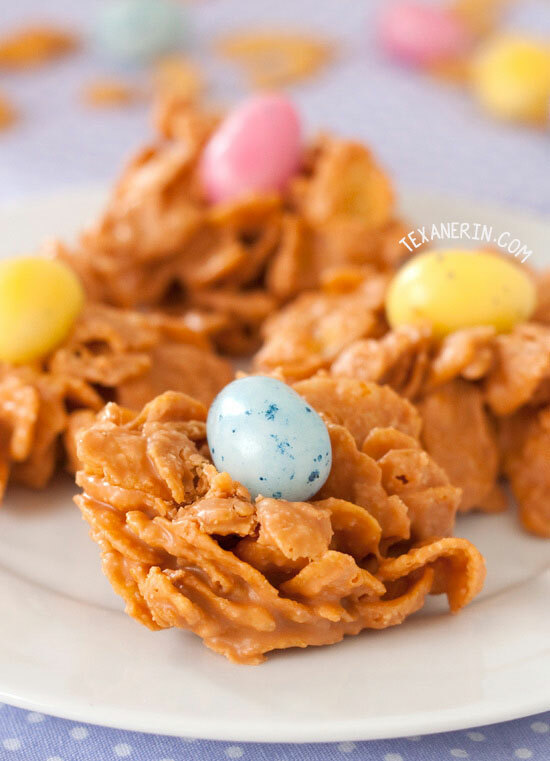 These 3-ingredient peanut butterscotch drops couldn’t be any easier to make and are perfect for Easter! I really had no idea what to call these so I went to Facebook and asked. I got loads of nice suggestions (thanks everyone! ), but my favorite is a mishmash of the ideas: three ingredient little crunchy baskets of hope. Doesn’t that sound delightful? ;) It really sums it up. They consist of just three ingredients, they’re little, they’re crunchy, and the baskets of hope was just too amazing not to include. This is for sure the easiest recipe I’ve ever posted. 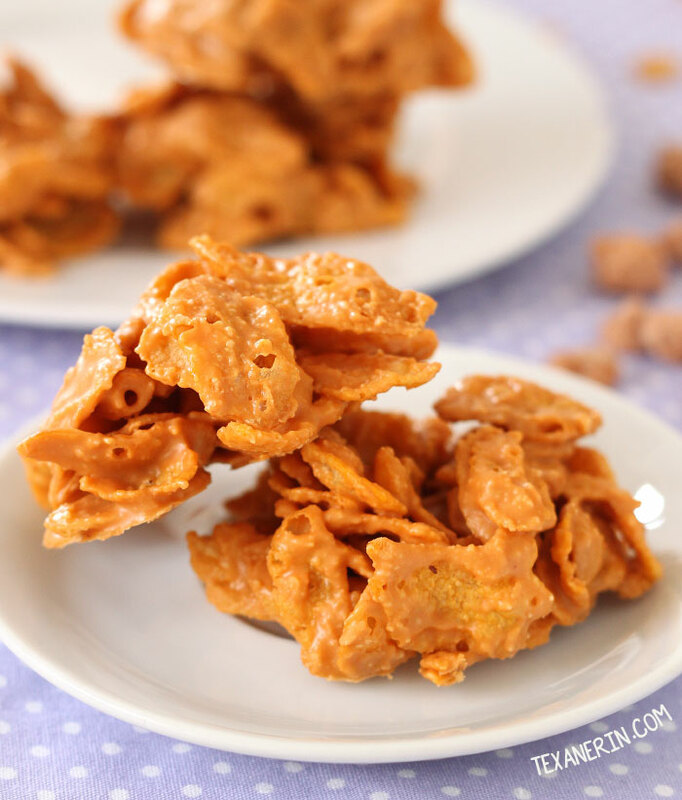 You melt peanut butter and butterscotch chips and add cornflakes. That’s the whole recipe. 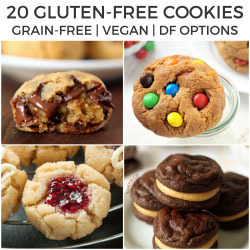 It’s true that these aren’t exactly, or really at all, healthy, but hey… I used natural peanut butter! That should count for something. And if you want, you could use whole grain cereal flakes. I found some from Kashi but I’ve never tried them myself. You can make these with regular peanut butter if you like and keep them at room temperature. But with natural peanut butter, they need to be kept refrigerated. At room temperature, they got a little gooey and starting falling apart. And as for how long they keep, I have to admit that I ate them all on the first day. I even told myself, “I’ll bring these to a friend instead of eating them all myself!” My mistake was not emailing this friend to tell her to expect some goodies. They just sat in the fridge, calling my name, and one after another, they all got eaten within a few hours. Luckily, I only made half the batch. If you have portion control issues, I’d suggest even only doing a fourth of the recipe. After raspberry white chocolate, butterscotch is probably my favorite flavor. And I’ve never posted anything with butterscotch because it seems almost impossible to make anything even slightly healthy with butterscotch and still have it taste amazingly… butterscotch-y. What are your favorite recipes with butterscotch? Melt the peanut butter and butterscotch chips together in a medium pot over medium-low heat. Carefully stir in the corn flakes and stir until all the corn flakes are coated in the peanut butter butterscotch mixture. Drop spoonfuls of the candy onto a Silpat or piece of parchment paper or wax paper. Let sit for about 15 - 20 minutes in the refrigerator and then gently press your Easter egg candy firmly into the center of each nest. I had one nest that fell apart so be careful! 25 comments on “Peanut Butter Butterscotch Drops” — Add one! My grandmother and I found this same recipe (minus the candies) in a children’s Christmas coloring book from the grocery in 1974 called “Caramel Chews.” We made them that Christmas and carried on the tradition every Christmas since! I love these! What a cute idea and you could fill with any kind of candy and make it a year round treat! I made something just like this with rice kripies awhile ago – so good!!! Love peanut butter and butterscotch together! These are adorable! My grandma used to make cookies like this all of the time. The addition of the egg candy is perfect! You are killing me with these. I have no willpower against them. NONE. Too cute, perfect for Easter! These are way too cute! I love the egg in the middle. Makes me want some! Awww such a cute name :) And I don't think anyone should leave off the little chocolate eggs. Those things make this oh so cute! peanut butter and butterscotch and a melty, crunchy texture. pretty sure you made these just for me Erin ;) butterscotch is one of my favorites too! Yuusss!! Love the look of these pretty little guys!! Yum! I LOVE butterscotch! Every year at Christmastime, I make these candies…I don't have a name for them. I just call them "butterscotches", (original, I know). Melt a bag of butterscotch chips, stir in a bag of mini marshmallows and a can of cocktail peanuts. Drop on wax paper lined sheet pans and refrigerate until firm. YUM! My grandmother used to make these all the time when I was growing up. I will have to make them for her now! They look great with the little egg candy on top. This definitely brings back old memories of my grandmothers cooking! She would make these all the time but without the little addition on top. It's time I made these for her! Three little ingredients–heck yes! These look so crunchy and delicious. Yum!